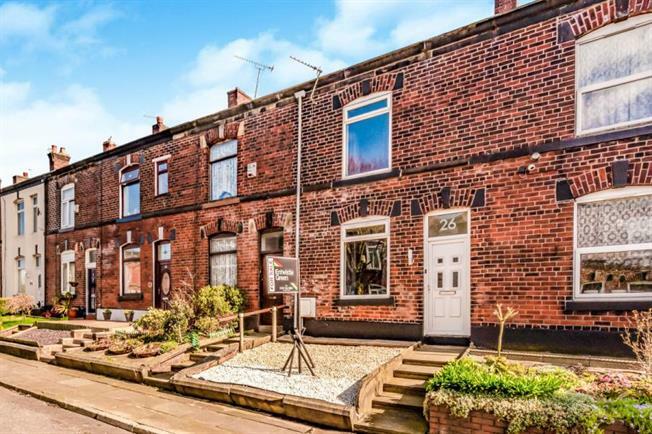 2 Bedroom Terraced House For Sale in Bury for Offers Over £100,000. Entwistle Green are delighted to offer to the market this substantial mid terrace property located in the popular area of Chesham in Bury, close to local schools, shops, amenities and transport links to Bury Town Centre. The accommodation on offer briefly comprises of an entrance porch, lounge, modern dining kitchen with breakfast bar and access to the rear garden, two spacious bedrooms and three piece family bathroom with heated towel rail. Externally the property boasts low maintenance gardens to the front and rear. The property also benefits from gas central heating with HIVE system, double glazing throughout and is available with no onward chain. Early viewing is essential for this well presented property. uPVC double glazed window, laminate flooring, ceiling rose, radiator. uPVC double glazed window and door leading to the rear garden, modern white gloss units and contemporary wooden work surfaces with breakfast bar, radiator, stainless steel sink with drainer, integrated, hov, oven and extractor fan, space for washing machine and fridge freezer.